£20 CHEAPER than Argos, Comet and Currys. Free delivery if you spend over £30 but remember the price is £24.99 excluding vat. 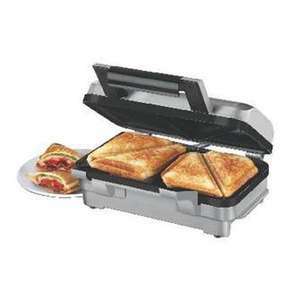 I have a sandwich maker similar to this! Works a treat! Ideal for a quick snack or something. Could anyone please tell me how to get the free delivery? Have spent £33 but still being charged £6 postage. Maybe it is because I don't have a Makro card. Thank you. Could anyone please tell me how to get the free delivery? Have spent £33 … Could anyone please tell me how to get the free delivery? Have spent £33 but still being charged £6 postage. Maybe it is because I don't have a Makro card. Thank you. Hi love1969, if you carry on through the checkout process it should say 'UK Mainland (Inc VAT) (£0.00)'. Im not a Macro card holder either... but just registered as a new customer. Thank you very much. I lost track of time and now it's expired! On a mission to find it elsewhere but loath to pay anymore than this offer! Years since I had a decent toastie! Thanks again. I'm pretty new to this fantastic site so not sure how to go about this but if anyone is still reading this thread ... This deal seems to still be available ie. NOT EXPIRED! Spend £30 before the VAT and you get the free delivery. Sorry, I don't know how to unexpire something.